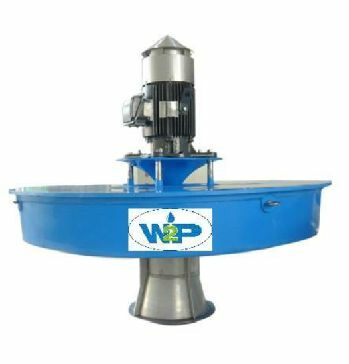 We are offering wide range of Aerators available in a variety of designs, capacity and dimensions. We are one of the well-known Manufacturers and Suppliers of Aerators. Made from superior-grade raw materials, our Aerators are robust, lustrous, excellently finished and durable. Buyers can get Aerators from us at market leading prices and place bulk orders. We offer customized Aerators as well. Aeration is the process of bringing water and air into close contact in order to remove dissolved gases, such as carbon dioxide, and to oxidize dissolved metals such as iron. It can also be used to remove volatile organic chemicals (VOC) in the water. 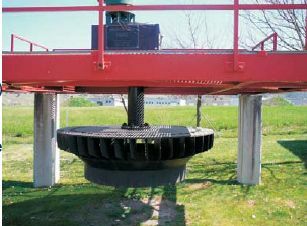 Aeration is often the first major process at the treatment plant. During aeration, constituents are removed or modified before they can interfere with the treatment processes. Aeration is used to treat tastes and odors, to help remove minerals such as iron and manganese from water, and to remove carbon dioxide from the water. Aeration removes or modifies the constituents of water using two methods - scrubbing action and oxidation. Scrubbing action is caused by turbulence, which results when the water and air mix together. The scrubbing action physically removes gases from solution in the water, allowing them to escape into the surrounding air. In the picture above, carbon dioxide and hydrogen sulfide are shown being removed by scrubbing action. Scrubbing action will remove tastes and odors from water if the problem is caused by relatively volatile gases and organic compounds. Oxidation is the other process through which aeration purifies water. Oxidation is the addition of oxygen, the removal of hydrogen, or the removal of electrons from an element or compound. When air is mixed with water, some impurities in the water, such as iron and manganese, become oxidized. Once oxidized, these chemicals fall out of solution and become suspended in the water. The suspended material can then be removed later in the treatment process through filtration.